The Dark Knight, the second film in the new rebooted Batman franchise, is a truly great motion picture. Since Christopher Nolan picked up the twitching remnants of the series from out of the hands of Joel Schumacher in 2005’s Batman Begins, the character has again become a cinematic force, free of the gaudy neon excesses of Batman & Robin, and back to the dark, gritty, tortured origins people like Bob Kane and Frank Miller envisaged. Christian Bale again returns as the caped crusader, who this time has to save Gotham from a villainous new adversary: the Joker (a superb Heath Ledger), whose anarchic reign of terror and seemingly mindless spates of violence is causing chaos in the city. Against this backdrop of lawlessness is another, more insidious threat, where politics, organized crime and corruption threaten Batman’s identity and his fight to rid Gotham of its dark underbelly. Maggie Gyllenhaal replaces Katie Holmes as Bruce Wayne’s long-time love Rachel; Aaron Eckhart plays the city’s idealistic and upstanding new district attorney Harvey Dent; and Gary Oldman returns as Batman’s ally in the police department, James Gordon; while Michael Caine, Morgan Freeman, Cillian Murphy and Eric Roberts round out the exceptional supporting cast. The only thing which hasn’t made a shift in a positive direction is the music, which again is written by Hans Zimmer and James Newton Howard. While I thought Batman Begins was a difficult, albeit generally decent score, The Dark Knight feels like a step backwards. Christopher Nolan tends to prefer film scores which are more textural, less theme-driven – as scores like Insomnia and The Prestige attest – and The Dark Knight continues the trend, taking it to an extreme of noisy bluster. Part of the problem, for me at least, is the lack of anything truly tangible to latch on to in musical terms. Batman’s theme, as created in Batman Begins, is little more than a two-note marker, while the new theme for the Joker in this film is a simple descending one-note chord that acts as a signifier for whatever malevolent havoc he is about to wreak. Zimmer’s intent, clearly, was to try to capture the schizophrenic, psychotic, depraved nature of the Joker’s character through his music, and to comment on the ‘one note’ nature of the character’s personality, and I suppose one could say he has succeeded: the incessant, overwhelming soundscape of the opening “Why So Serious?” invades your brain like some kind of evil parasite, flittering and buzzing around the speakers, before it heads off into some kind of twisted, thunderous grunge-rock territory which may make those with weak constitutions leap for the off button. It’s just that it’s so difficult to connect with on any level beyond a sort of vague acknowledgement of what Zimmer was trying to do. This, coupled with the general unpleasantness of the music in question, makes for very difficult listening. The action music melds this angriness with typical Zimmer-style rhythms, in which the orchestra lays on the layers of sound thickly, plays at a generally fast tempo, but is somewhat overwhelmed by the electronic embellishments which, as usual, detracts from the orchestral nuance, and reduces the music to a blob of aural soup which just sits there, looking at you, daring you to find any depth. “I’m Not A Hero”, the exciting “Like a Dog Chasing Cars”, “And I Thought My Jokes Were Bad” and parts of “Agent of Chaos” are probably the best examples of the action writing on the album, and on their own terms are quite enjoyable, but other cues – “Always a Catch”, “A Little Push” and “I Am the Batman” for example – stretch the limits of the eardrums with their growling, uncompromising nature, unexpected interpolation of unusual industrial sound effects, and general lack of anything coherent beyond volume and velocity. The only moments of respite come courtesy of James Newton Howard and his theme for Harvey Dent, which first appears in the hopeful-sounding “Harvey Two-Face”, and later occur briefly in “Blood on my Hands”. The warm chords and powerful sense of heroic nobility comes as a true relief from Zimmer’s relentlessly vicious onslaught, and stands as the high point of the score, much like the similar “Macrotus” from Batman Begins, parts of which are restated to excellent effect at the end of the cue. The 20-minute conclusion begins with a tortured string elegy in “Watch the World Burn”, before shifting into “A Dark Knight”, which runs the gamut of all the different musical styles, themes, chords, and effects the score has to offer. Some of the string writing in the finale at times is reminiscent of the powerful undulations Zimmer created for The Da Vinci Code, which worked well enough in that context, and actually work fairly well here. Still, the nagging doubt remains about what might have been. It’s all a great shame really, because the film deserves music of a higher quality than this. Batman is such an iconic figure, with the potential to inspire such wonderful music, that for him to be saddled with a score that consists of little more than a couple of power chords, a whole load of sub-industrial dissonance, and some just-about-better-than-average Zimmer action cues is very disappointing. I’m past the point of pining for Elfman and Goldenthal, and I even recognize what Zimmer was trying to do with The Dark Knight – I really do! However, having a cerebral understanding of the composer’s intentions doesn’t make the actual act of listening to the music any different, and over the course of the numerous times I have listened to this album, by the end I couldn’t wait for it to finish. Music composed by Hans Zimmer and James Newton Howard. Conducted by Matt Dunkley, Bruce Fowler and Gavin Greenaway. Orchestrations by Bruce Fowler, Jeff Atmajian, Brad Dechter, Elizabeth Finch, Kevin Kaska, Randy Kerber, Suzette Moriarty and Walter Fowler. Additional music by Lorne Balfe. Recorded and mixed by Geoff Foster. 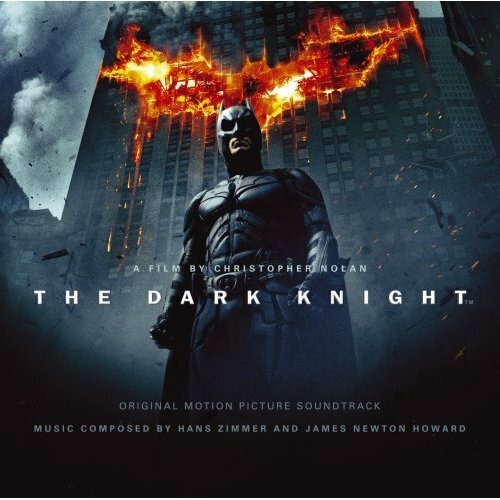 Edited by Alex Gibson and Daniel Pinder Album produced by Hans Zimmer and James Newton Howard.